yesterday rejected attempt by the Federal Government to rebuild the burnt school insisting that all they wanted was to have their children back home. Federal Government officials led by the Minister of Finance and Co-ordinating Minister for the Economy, Dr Ngozi Okonjo-Iweala had two weeks ago visited the Chibok community during which she announced plans by the government to rebuild the school that was burnt by the insurgents as well as resettle some of the displaced persons. 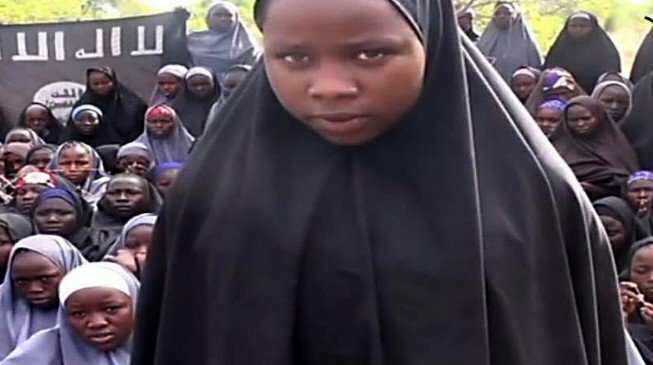 Some parents of the 219 abducted schoolgirls and concerned members of Chibok community however yesterday condemned the visit by the Federal Government officials and the pledge to rebuild the school, insisting that what they wanted was to bring back their children. Addressing journalists in Maiduguri, the Borno State capital which was attended by hundreds of Chibok people residents in Maiduguri, the Caretaker Chairman of Chibok Council Area, Mallam Ba’ana Lawan accused the Federal Government of making failed promises of rescuing their 219 abducted schoolgirls. He also expressed dismay over the government move to rebuild Government Girls Secondary School, GGSS, Chibok which was destroyed by the insurgents after abducting the schoolgirls. According to him, “It is disheartening to inform you that since the abduction of these girls, the Federal Government did not bother to send delegations to Chibok to sympathize with the parents, instead, the parents were invited to Abuja and conveyed in cargo military plane with no comfort whatsoever. “We still observed that recently, President Goodluck Jonathan visited Mubi and Baga, but failed to visit Chibok to sympathize with our people. appreciate Governor Kashim Shettima and his wife, Nana Kashim Shettima who not only visited Chibok when the incident took place, but also secured admission to the 59 school girls that escaped from the Boko Haram to study in various schools in the country and all assistance he has rendered to the parents. “It is most unfortunate that Chibok Local Government Area has witnessed six different attacks by insurgents and about 300 people lost their lives with property worth millions of Naira destroyed, hundreds of houses razed down as well as food and cash crops looted. The most recent attacks being that of Gatamwarwa, Kautikari and other surrounding villages where several lives were equally lost. Yet there was no response from the Federal Government. “We therefore condemn the move by the Federal Government to embark on the reconstruction of the school (GGSS Chibok)instead of bringing back our girls as severally promised”. consistent effort to ensure that the girls are rescued.